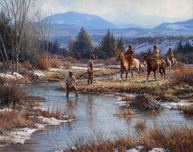 Martin Grelle lives with his wife, Terri, and their children near the small, Central Texas town of Clifton, just a few miles from where he was born. 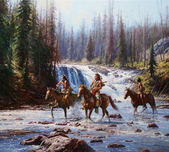 Rich in beauty and history, the area has become a Mecca for artists, which is one reason why Martin Grelle has spent his whole life there. Many of his closest friends are artists. 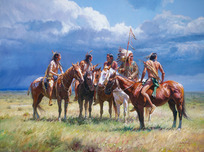 They gather to see each other's work, exchange ideas, and just "shoot the breeze." 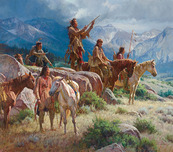 Martin Grelle treasures the camaraderie among these artist friends, and the rare opportunity it affords him. 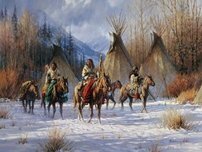 Martin Grelle's work reaches far beyond his Texas home, conveying the spirit, drama, beauty, and vastness of the American West. 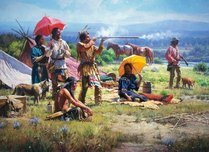 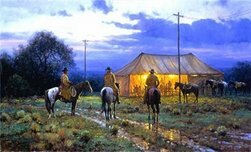 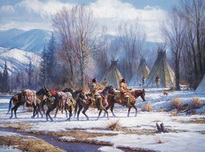 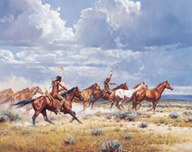 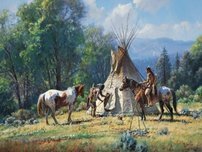 Whether painting a Native American in a dramatic setting, or a working cowboy on the range, he captures the essence of the West in his historically-accurate, picturesque, yet compelling, images. 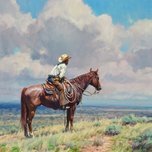 Martin Grelle enjoys the Cowboy Artists of America's (CAA) trail ride each year and manages to spend some time occasionally working cattle with local friends. 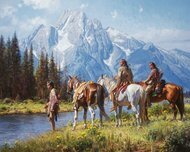 He is proud of the Native American part of his ancestry, and studies diligently to portray their culture accurately and sensitively.